Céline Mansanti (cmansanti@gmail.com) teaches American literature and history at the Université de Picardie Jules Verne (France). She is the author of La revue transition (1927-1938), le modernisme historique en devenir (2009). Grant F. Scott is professor of English at Muhlenberg College in Pennsylvania and author of The Sculpted Word: Keats, Ekphrasis, and the Visual Arts (1994). He is also the editor of Selected Letters of John Keats (2002) and Joseph Severn: Letters and Memoirs (2005). Last year he and his students curated Wings of Fire: The Illuminated Books of William Blake at the Martin Art Gallery at Muhlenberg, an exhibition which was reviewed in the winter 2008-09 issue of Blake. Brent E. Kinser is assistant professor of English at Western Carolina University, an editor of The Collected Letters of Thomas and Jane Welsh Carlyle, Carlyle Letters Online <http://www.carlyleletters.org>, and Carlyle Studies Annual. His (mis) spent youth, however, was devoted to music. At the age of thirteen, he was honored by the Society to Preserve Bluegrass Music in America as “the most promising banjo player,” and later, until 1997, he pursued a career in Orlando, Florida. Stephen C. Behrendt is George Holmes Distinguished University Professor of English at the University of Nebraska. His most recent book is British Women Poets and the Romantic Writing Community (2009). Andrew Lincoln teaches in the English Department at Queen Mary, University of London. He is currently working on the culture of war in eighteenth-century Britain. 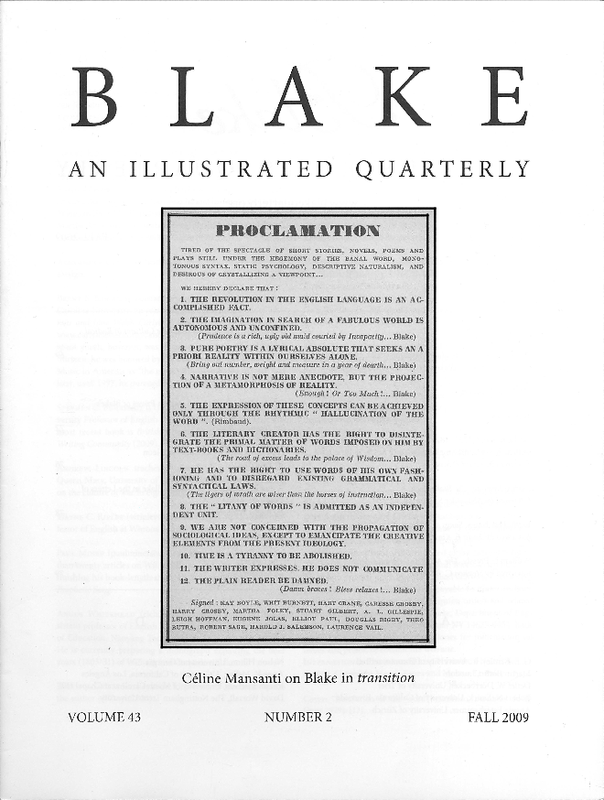 Paul Miner (paulminer@cableone.net) has published more than twenty articles on William Blake, and is in the process of finishing his book-length study on the poet-artist, The Bard’s Prophetic Song. Angus Whitehead (richard.whitehead@nie.edu.sg) is assistant professor of English literature at the National Institute of Education, Nanyang Technological University, Singapore. He is currently preparing a monograph exploring the later years (1803-31) of William and Catherine Blake. Jennifer Grotz teaches at the University of Rochester and is the author of Cusp (2003). Cover: “Revolution of the Word” manifesto, transition 16-17 (June 1929): .